Do you have a plan to go for a horse riding holiday? Maybe it’s your first time or maybe you’re an expert. Whatever the case, I know you want to look like a born and bred rider. I understand if you feel nervous when you’re just about to ride a horse. Well it will be advantageous if you feel and act confident. To make your horse riding activity awesome you only need to follow some tips. Don’t show up for the riding in a short skirt or some high heels. Look like you’re part of what you are doing or just about to do. Wear a pair of comfortable jeans and a t-shirt. For the footwear it’s advisable you wear some closed-toe shoes. A pair of boots will be most preferred. Look like a cowboy or a cowgirl. Ensure that the horse assigned to you matches you. For instance, if it’s your first time riding, you should be assigned a thick, slightly slower horse and one which is calm. The horse owner is definitely aware of how each horse likes to be handled. Let him share how to go about it for the horse assigned to you. This will make you feel familiar with the horse as you approach it. Let the handler take the horse from the horse trailer, don’t do this yourself. The horse can sense people unfamiliar to it this may make it agitated. I’ve even seen horses kick and bang against the trailer and the handler didn’t have any horse trailer insurance. When you meet a friend you start by greeting them. Do the same to the horse you are about to ride. You will do this by extending your right arm offering the back of your hand to the horse. The horse will smell your hand and eventually touch it with the horse. This will create some type of bond between you and the horse. A horse being a living creature, it have feelings too. If you act uneasy it can feel it and be nervous about your riding it. This can result to some movement by the horse as you mount it and in case this happens you will fall. Horses are trained to be mounted from the left hand side. Don’t hurt the horse by pulling the horse down as you mount. The best position to take for ease control of your horse is to sit upright and relax your back. You must balance yourself to ensure that the horse doesn’t feel like it burdened. Don’t grasp the reins as if you are about to run a way but instead, be gentle. Have your arms relaxed. Pulling too hard will hurt the horse thus you must avoid hurting it. Actually you can use one arm to hold both reins. It will make you look like an expert in the horse riding activity. Don’t stare at your horse since you will lose focus. Remember you are the one riding the horse. Don’t assume that it has eyes and should know directions to follow. It’s your responsibility to control it. If you’re heading toward your horse trailer with it’s new horse trailer accessories be careful not to scare the horse and cause them to trip on the trailer ramp. In a way horses behave more like girls. They want attention and to be treated like kings and queens. For this reason you must show love to your horse. Don’t forget that the horse will know when you’ are focused on it and when your attention is elsewhere. Don’t be too afraid to fall, it happens. I know if makes you feel inexperienced, especially if it’s your first ride. To avoid this embarrassment you have to dismount like an expert. Let someone hold the horse to keep it calm. If you’re by your horse trailer you can ride the horse alongside it, and use the horse trailer tires as a step stool. If there are other tips and tricks you think our readers need to hear about please send us an email and tell us about it. We would love to hear from you! The world is full of different species of animals having their own uniqueness. Each of us relate to some or the other character in a particular species that we seem to grow fond of. But, the moment someone mentions about grace & fierceness, its certainly the horse that comes to our mind. It has always been a pride to own a horse of a specific breed amongst the elite class. These horses have been trained for years to participate in International Riding and Dressage events. Dressage is considered as an Olympic Sport. It basically refers to the art of training & riding a horse in a specific way that it develops traits of discipline, balance & agility. The art also looks forward to the precise movements of a horse & expects the species to comprehend signals from riders with bare minimum effort. So, for all the horse lovers out there who wish to own a breed that shines its way at the Dressage events, have a quick look at the top preferred dressage horse breeds. They are warm blooded species, perfectly suitable for Olympic events. Hanoverian is a breed that was created in Germany. But, apparently now they are found on all continents. Since ages, they have been processing with the tag of prominent riding horses. They are tall & grow up to 1.75m or about 15 to 18 hands (unit of measure for horses). They often possess qualities of boldness white being sensible at the same time. They usually take long strides and have excellent jumping traits preferably why they participate in a variety of jumping, running & dressage events. Their origin is that of a German breed. These warm blooded species stand an amazing chance at winning almost all Olympic & International dressage horse breeds events. They too are tall horses growing up to 1.78m. They have a willing temperament that makes it easy to train them under strict regulations. As a result of which, they give excellent performance while managing to look graceful in their beautiful body. They belong to the Spanish breed although they were originally developed on the Iberian Peninsula. They are usually born with a darker skin tone and lighten with age. They are found in black, grey, white or bay. They are believed to have high intellect and ability to learn. They are highly energetic while being agile during dressage events, credits to their muscular back. They are medium sized with a height of 1.5m or 15.2 hands. They date back to 15th Century and were also known as Pura Raze. They are a Caribbean breed that appear to be light on visual front thereby explaining their name, Paso Fino meaning light step. They are medium sized horses growing up to 1.58m. They indeed are a combination of being fierce and friendly when required. They are one of the less popular dressage horse breeds as compared to Hanoverian or Andalusian but perform well to the best of their ability. Almost similar to the Andalusian Horses, they too were developed on the Iberian Peninsula and were considered to be a part of the latter species till 1960s. They belong to the Portuguese origin and date back to 20,000 BC. They have also been used as war horses. They grow to a height of about 1.62m and are available in shades of grey, chestnut or bay. Apart from being one of the most preferred species amongst the dressage horse breeds, they participate in running & bull fighting events as well. Belonging to the German origin, they are considered to be the oldest warm blooded species of horses In earlier days, they were used to pull carriages over long distances and to carry materials due to the strength they possess. They have an athletic appearance and strong back that makes them a fit choice for dressage sport. They are tall with a height up to 1.73m. With their arched neck and strong back, they have an amazing physical appearance. Also known to be very enthusiastic in nature. Make sure to select the breed not only based on physical attributes but also considering functional potential. So, before the next Summer Olympic strikes, make sure to own the best choice amongst dressage horse breeds that vivaciously perform and return victorious. Which horse breed did you choose, tell us about it. A colt’s training commences the very moment it hits the ground. Being a prey animal, it is a natural instinct that your colt will pick up skills from its mother that would necessitate its survival as if in the wild. If left in this state, your young colt will become similar to a wild horse. Therefore, training a young colt should start as soon as it is able to stand, usually a few hours after its birth. To lay the perfect foundation for training your colt, it is important to create an environment where your colt’s trust for humans will grow hence making it feel more comfortable around people. To be able to achieve this, there are two major steps to undertake. First and most importantly is the approach. It is imperative that your colt is approachable or it is comfortable approaching you. To help you develop this rapport, you will need to feel your colt all through its body from different angles. Maintain the contact as the colt moves and only moving away from it whenever it stops. Having its mother in the stable will help it be more receptive. Secondly, your colt will need to learn how to respond to different pressure applications i.e. how and when to move away or when to follow. These are the initial steps to help build body awareness and coordination for your colt. Confidence and trust in your colt translates into stress-free routine care that is necessary for the overall health of your colt. After confidence and comfort are embedded in your young colt then you can start ground training. At this stage, you can introduce elements that will trigger flight reaction in your young colt and also form a basis for communication. These elements are movement, sound and touch. This is best done in a fenced area as opposed to the stable, which will help him become familiar with obstacles such as hula-hoops, barrels, water and noise. Introduce a saddle over his back and a hackamore. Initially, this can be done at cross lies until the colt is receptive to the saddle. Make sure he is comfortable walking around with it. Keep track of your training progress by accessing his behavior when you lead him at a walk or call for him to halt. Also, take note of how your colt is responding to your change of pace. Train the colt for his first ride by hopping on and off him from both sides. This way he’ll be ready for when you start using the stirrup. At first when atop him, try and follow his movements without directing him unless when you have to. It is important to just go at your colt’s pace at this stage. You can start to direct him once you realize he is comfortable with you on his back. Be sure to hold firmly so as to achieve desired results all the while being gentle. It is important to end a training session after a training after achieving a positive reaction from your colt. This will form a starting point that he’ll be readily acceptable to in your next training. Training your young colt should be an enjoyable experience for the colt and yourself. A good training will be reflected on how your colt is adaptive to the world. When it comes to a successful training, routine and consistency are key. Also, never forget to maintain a relaxed environment especially at the initial weeks of training. Training your young colt is a race where speed is not the measure of victory. Slow and steady pace over time will grant you positive results that will prepare your colt for enjoyable rides for the rest of his life. I hope you gained some knowledge through this post, please tell me if you use different techniques. Would love to discuss them with you. Horse riding competitions are a very relaxing past time activity for both an equestrian seeking glory from the sport or a watcher who will form part of the wild audience. Engaging in horse riding may be compelled by many reasons from having a relaxing moment with friends or watching your favorite horse in the competition. It is also an economic activity for some, the bookies who make loads of dimes from setting bets on the horses. For whatever reason you will definitely want to check out these horse riding competitions. So how do you find such competitions in your locality? Here are the various ways to keep tabs on the competitions involved with these graceful equines. The newspaper or any other periodical publication in your locality will definitely have the right information on a lot of events taking place and horse riding competitions will not be an exception. You can check the sports section of the newspaper. There is a high chance these type of announcements will be posted there. If not, you may check on the events coming and you might find such events in this section. Take note of the date and time for a proper arrangement not forgetting gate charges in case there will be charges. Communication has really been improved thanks to technology and, more so, the advent of social media. Platforms such as Facebook and Twitter are great sources where you can get information on an event such as the aforementioned competitions. These platforms are mostly used as announcement and advertisement tools for such events due to the high chance of reaching a multitude of people who are social media users. Narrow down your search for events to “events near me” and you will get what you need. The stadia which are the racecourses where horse riding competitions are held are another good source for finding the information you need concerning where the competitions will be held. Such arenas, most of the time have noticeboards where important information is placed to pass important information. Information about competitions is definitely important and will tell you more about the competition in terms of the venue, participants, gate charges and time. Also in case of any changes, the notifications will be updated from the notice boards, hence it is a good and reliable information source. Being a participant or an avid follower of such competitions will definitely endear you to a group of like-minded individuals with interest in such competitions who may be part of your clique. There is a high chance that in this group there are one or more individuals with information on such competitions. You do not have to miss out on a good time with friends watching some relaxing horse riding competitions. The outlined are the various sources on how you can get information on where such awesome activities are held. I really hope you enjoy visiting the horse riding competitions around you. Tell us all about it. Horse riding is a fun thing to do. Most people enjoy this experience. For it to be more fun one has to make sure that they wear full protective gear. This includes the horse riding gloves. Most people may think that gloves don’t play any role in protecting them, but they do bring a lot of importance with them. To keep the rider’s palm warm – The horse riding gloves help to keep the hands of the rider warm, this warm allows good circulation of blood in the hand. They help to protect the rider from numbness, which may lead to accident. The warmness around your hands ensure that you can perfectly grip the reins as you ride your horse. To ensure that you have a good grip – The gloves are well made to ensure you can hold tight to the reins without letting go. The gloves cannot sweat compared to bare hands. The gloves prevent friction force that Can be caused between your hands and the reins. It is therefore evident that the gloves will help you in gripping the reins strongly and tight making you enjoy your ride. To protect your body in case of accident – For a normal person, when one trips and falls down the first thing that your instinct tells you is to throw your hand. The same thing happens when riding a horse and you fall. Having gloves on your hands will help you land with your hands and you may prevent the rest of your body from being injured. Helps to prevent hands burns from reins – Holding right to the reins without gloves sometimes can lead to blisters. This is because of the friction between the hand and the reins. Having horse riding gloves will protect your hands from all these. Your hands will remain smooth and safe. Prevent hand numbness – With the ability to provide a warm environment for your hands, the gloves ensure that your hands are not numb no matter the type of weather. This ensures that you are safe and you have the potential to grip the reins well. To protect you while leading the horse – In order to lead the horse you must grasp the reins well. Sometimes the horse may be stubborn and it gives you a hectic moment and you may be forced to use force. The gloves will protect your hands from being torn by the reins while using force. Protect your hands while grooming and mounting the horse – The gloves help you to hold tight to other equipment for grooming your horse. This helps you have a good grip while mounting the horse and setting it ready for riding. Keeps your hands clean – The gloves help to protect you from contaminating your hands. Having gloves will always ensure your hands remain clean when grooming your horse. This will also help you have a healthy life. Prevent a lot of sweating from your hands – Gloves help to ensure that your hands don’t sweat and become slick. Slick hands may lead to accidents due to poor gripping of the reins. Provide a comfortable shelter for your hands – Apart from just making your hands warm, gloves also ensure that your fingers are protected from direct sunburn and even from anything in the surroundings that can harm them. With all these advantages of using horse riding gloves it is your responsibility to make sure that you always wear them while taking a horse riding. Having them will make sure that you enjoy every moment you are riding your horse. If you have other reasons why it’s important to wear riding gloves or if you have some gloves you’d recommend send us an email. Proper care of your saddle pads is very important. This involves the cleaning and storing. Not only does it prolong its use but also keeps your horse hygienic. It might seem an easy task but in the real sense it isn’t. You need expert advice to know the proper way to do it. You should, however, consider the type of pads you have. This will help you in choosing the best way to clean it. The level of dirt also determines how often you should clean your pads. Brushing hair out of the saddle pads is the first step to cleaning them. You should gently scrub the hair after every ride. This is also important when you want to wash the saddle pads. It is recommended that you wash the saddle pads using lukewarm water. This is water at about 30 degrees Celsius. If you use water hotter than this the elasticity of the saddle pads will be damaged. The type of soap best for saddle pads cleaning is Woolite. This protects the elasticity of your saddle pads. Below is a step by step guide on saddle pads cleaning. – Soak your white pads in lukewarm water until it reaches the salt line. – Apply Woolite soap on the pads leave it to soak for 15-20 minutes. – Gently brush your pads using a curry comb in a circular manner. This will ensure that the dirt gets out to the edges of the pads. If you are dealing with dark-colored saddle pad there is no need for warm water. Soak them in cold water with strong agitation. Gently wring them when rinsing. Be sure to use enough water to fully get rid of the dirt. When rinsing the pads you should do it at an angle. Do not spray on them directly. This might tear the inner parts due to the high pressure applied. Move the hose away from the pads. Properly rinse them. Rotate the pads to ensure the dirty soapy water flows outwards. This prevents it from seepping into the wool. If you leave any Woolite residue you are endangering the life of your horse. The residue may cause itching of the skin. It is advisable you thoroughly rinse the pads to avoid this predicament. After through washing it’s important to properly dry them. Some pads can be hanged on the rails or on the gullet holes. Others that are woolen require to be laid flat on the ground. Avoid laying your pads on their backs to dry. This will keep the inner lacing intact. Machine washing can be the best way to clean your saddle pads. However, this method might not work for some types of pads. Check the labels first before choosing this method. This is very important to ensure you don’t damage your saddle pads. Keeping your pads clean gives you a comfortable ride. It will prevent shock and give you a long service. It also ensures the health and safety of your horse. Don’t forget that you will also get value for your money. Games and sports has never been more fun than doing it in the right gear. As humans, we always need to spend quality time with our family and friends or even colleagues at work. There are different ways of doing this. Most people prefer games and sporting activities. It has been found to be more uniting on the pitches and fields than in vacant living rooms staring at each other. While in the fields, people can play together as they talk and discuss things over. There has been no better way of outdoor interacting than horse riding! You want to horse ride? Horseback riding is fun. It is the best outdoor activity that anyone would ever do with family or friends. Imagine playing with the skits you can talk to! Horses listen when we talk to them, and they at times respond. When on a horseback, you control the ride, just like in any prestigious vehicle, probably a sport car. 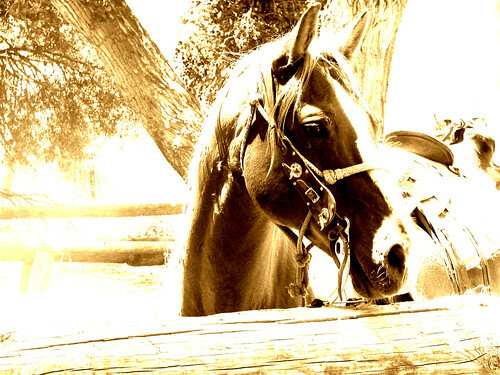 The horse however, listens to you, empathizes with you and most importantly, cares about you. Everything has a price to pay though, and the price for a horseback ride is the simplest. You only need to be in the right riding gear for you to enjoy. Most cowboys say that if you are not properly dressed for the occasion, the horse will not listen and even the horseback will be too bumpy for you, you will not have peace up there! One most important gear for a horseback riding is the horseback riding boots. This skit has to be just the right one. Your boots must be perfectly fitting, not too tight, and not too loose. Horseback riding can be dangerous especially to those with improper dressing, wrong boots. To avoid accidents and discomfort during your ride, find the best boot and if it necessitates, you could customize it to make sure that it is just in the best shape and size that you want. There are several horseback riding boots companies in the United States of America. You can therefore never miss on one that best suits you and your fellow riders or cowboys. Safety comes first, your comfort then the ride. Horseback riding boots are not in the usual size of a shoe. Boots are longer reaching up to the knees. They must be made of pure leather and their design is distinct. You can never miss a riding boot when you see one anywhere on the planet. They have a tough sole that fits and matches with the saddle. Horseback riding is a sport of a kind. It is even more enthralling when you wear matching outfits- boots whose color matches with your belt and hat. It is better still it they also match the saddle and the horse itself! Horse riding is a priceless sport. You get to reunite with family and friends as well as get closer to nature. You will be able to talk to nature itself, the horse, but wait, you must be in the right riding boots! Next time you want to horse ride, try it my way, put on nice riding boots and you will thank me later. Before going to find a new home for your horse, try to keep it yourself. Yes! Keeping a horse is costly, but you can reduce your expenses while still taking better care of that horse. You cut the cost by choosing the best and healthy feed within your budget. You might know of a horse lover who is always looking for a horse to keep. He might be interested in adopting that rescued horse. If you don’t know anyone who can adopt your horse, try using the internet and social media. Take a photo of horse and upload it, you will be surprised to find so many people open to adopting a horse. Before handing over the horse to someone, make sure they will take proper care of the animal. Donating can be another option for re-homing a rescued home. It might be a difficult way to re-home a horse because finding a good new home is always hectic. You might have heard of organizations that offer animal therapy programs for physically or mentally challenged children and adults. These organizations have horse riding therapy programs as well and they may accept your horse as a donation. Remember that, they might have specific requirements for allowing an animal for their programs like health and temperaments etc. If your horse is eligible for them, they will take a few tests and will accept your horse for a 30 day trial for assessment and training. After all the procedure is completed, your rescued horse will get a better home, where organization staff will take proper care and provide healthy diet to the horse. Look for a college or university in your town with an equestrian team. These colleges and universities train their equestrian team to compete in many different events. If the rescued horse is suitable for riding training or even race, they will be interested in it and can accept it as a donation. These institutes have facilities and will take good care of your animal. Different community organizations have riding camps programs such as church groups, residential community organizations or even private organizations. If the horse is healthy and kid-safe, they will accept it as a donation. Before donating a rescued horse, please do proper research on reputation and facilities of that riding camp. Inquire about how and where they will keep your horse in winters or off-season, what will they do with your horse when its riding career is over. Before choosing any of above options, please do your proper homework. Your choice and research will decide the future of that rescued horse. If you worked on it well, your horse could play a significant role in the treatment of a disabled child or training of a young athlete. There are so many horse retirement farms where you can re-home a rescued home. They provide shelter and take proper care of horses. Sometimes, they can charge your for their services, but these charges are lower than keeping a horse at home.